Those offices that need to charge sales tax have the ability to populate specific sales tax rates (regions) that are then assigned to contacts. Sales Tax Regions allow for time that is tracked to be considered taxable and generate the appropriate amount of sales tax based on that time. One thing that you want to make sure is done before any time is tracked, if you are going to charge sales tax, is go into the Work Codes setup screen and make sure the desired codes are marked as Taxable. For those codes that are not marked taxable, sales tax will not be accumulated. To set up your Sales Tax Regions navigate to the Setup>Billing>Sales Tax Regions>Assign and that opens the Sales Tax Regions window. Tax Region Name allows you to name this region. However you want to name the sales tax region will be what displays when you are choosing it for your client. Primary Sales Tax is the first sales tax that will calculate on the dollar amounts generated by the time tracked. Secondary Sales Tax is an optional tax that can be populated in addition to the primary. Once the Sales Tax Regions have been created, they need to be applied to clients. This process can be done one at a time in the Contacts tab for the desired contact in the bottom right hand corner. Use the Edit button in the toolbar and then fill in the appropriate sales Tax Region. Sales Tax Regions can also be populated in mass by using the Setup>Billing>Sales Tax Regions>Assign. The View By field allows you to sort your left hand list of WorkSpace by specific fields on the Contacts tab. The following field will display the chosen sort and allow you to choose which sort you want to apply. For example, if the View By was State/Province you would choose the state or province in this field. The field in the middle of the two lists represents the Sales Tax Region that is being assigned. 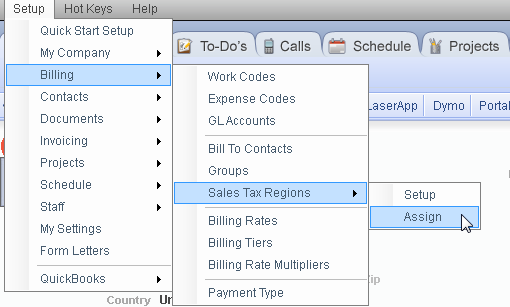 To assign or remove contacts to/from the chosen Sales Tax Region, use the corresponding Assign or Remove buttons. Please note that when a contact is created it will pull the default tax region from the My Company settings. To adjust this Default Sales Tax Region, navigate to Setup>My Company>Information & Settings.